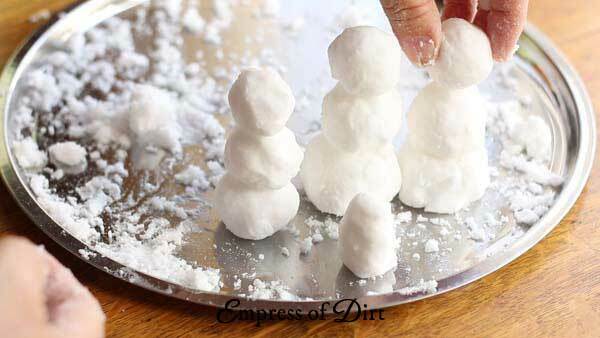 This shows how to make fake snow for crafts or mini snowmen. There are six basic fake snow recipes plus step-by-step instructions perfect for winter crafts, snow globes, and tablescapes. The easiest recipes use just two household ingredients to create your little winter wonderland. 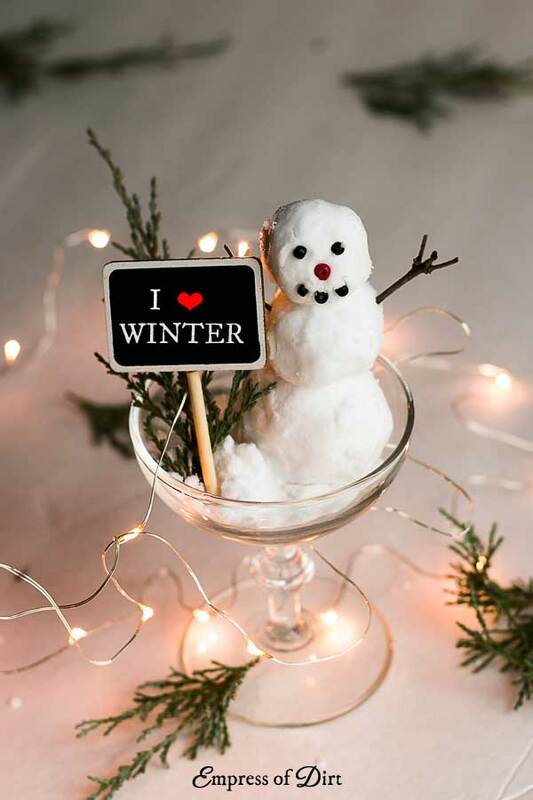 Also, see DIY Snowman Hot Chocolate Gift Kits for another winter-themed craft idea. There are all sorts of fake snow recipes and the one you’ll need depends entirely on what you want to do with it. 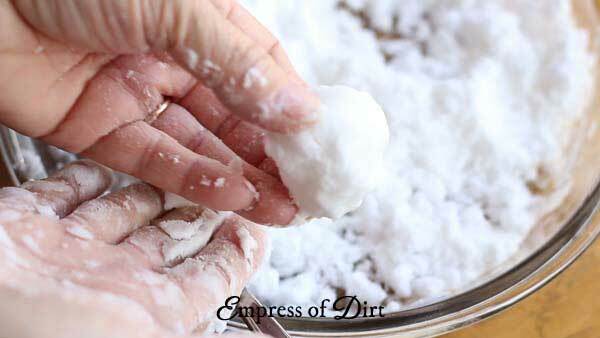 I have listed 6 Recipes for Fake Snow (below). 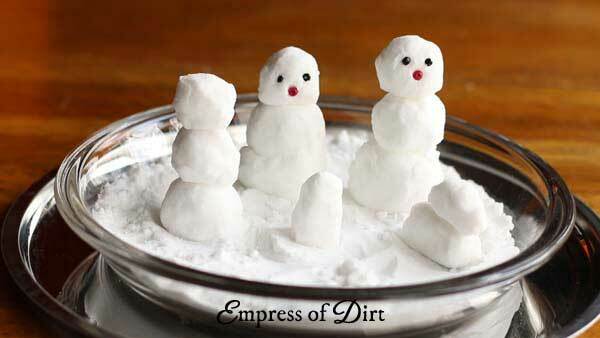 The tutorial (below) uses a snow recipe perfect for crafting little snowmen or snow animals. They make really sweet place markers for a dinner table as you will see below. Also, if you use the recipe here, when you are done with your snowmen, just remove the embellishments, and use the ‘snow’ to clean sinks or your bathtub. It works very nicely. No waste! 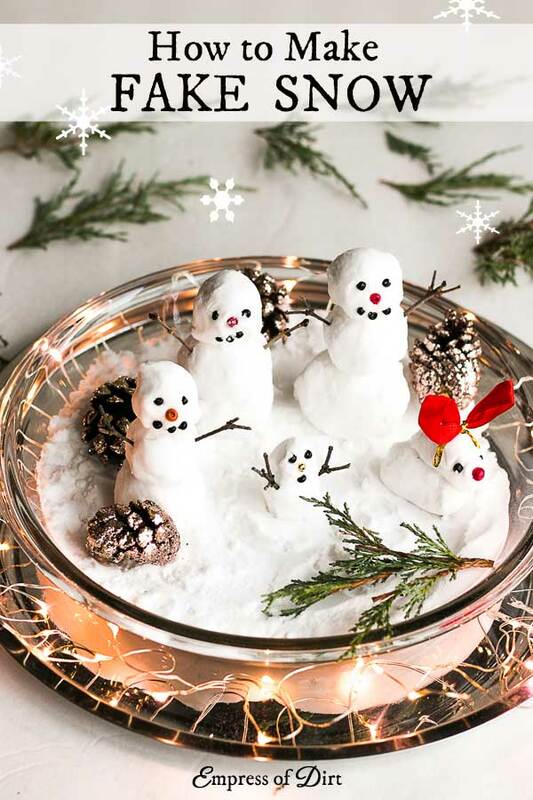 If you just want something that looks like snow for an indoor, winter fairy garden, but do not wish to make snowmen, coarse table salt looks really pretty, especially with fairy lights shining through the salt crystals. Just add some fairy garden accessories and you’re done. Now let’s make some snow. 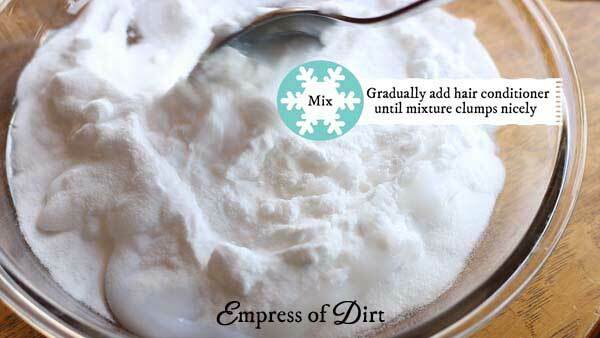 This fake snow recipe requires two ingredients: baking soda and hair conditioner. With the right proportions, they bind together to form a snow-like material. And no, it’s not cold to touch, but, oddly enough, it does resemble snow both by looks and feel. This is what I would call a temporary craft. While the snowmen will last indefinitely, this is only if they are left alone. The ‘snow’ is fairly crumbly so they can’t be played with or knocked about. If you plan to do this with children, be sure to make some ahead of time so you can understand what it’s like first. A child who enjoys fine motor skills and has a steady hand will enjoy it. One who is accustomed to Play-Doh, which is quite stretchy and forgiving, will probably not enjoy it. You can also use shaving cream instead of hair conditioner. I find the shaving cream does make a firmer snow ball (one you can throw), but it tends to have a stinky scent (to me). 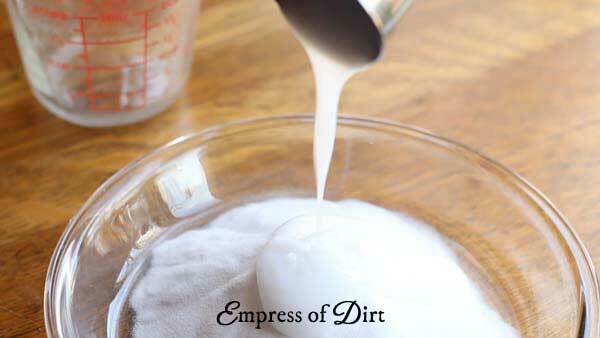 Other people say they just use baking soda and water. I’ve never found it binds as well as hair conditioner. The exact amount needed varies depending on how watery the hair conditioner is. Add it gradually, as instructed below. For the snowman scene you see pictured in this article, I used ¼ cup Hair conditioner and 1 ½ cups Baking soda. 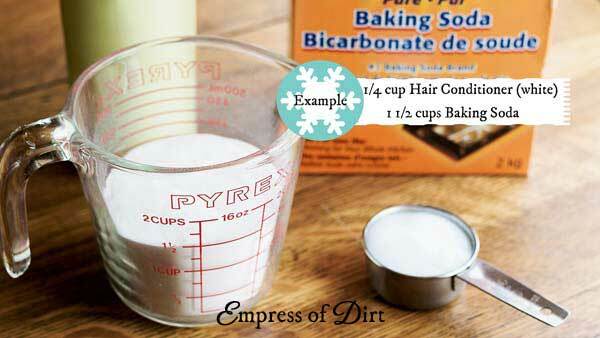 2 Combine the baking soda and hair conditioner in a mixing dish or bowl. Some brands of hair conditioner are quite watery and you’ll need less of it. Some are quite thick and you’ll need more. Add the hair conditioner gradually. 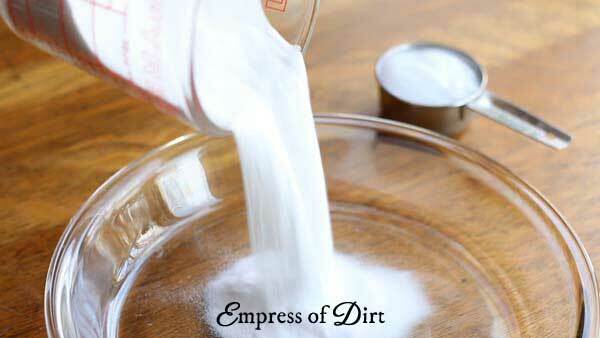 Mix it with the baking soda and check for it to become clumpy. You want to be able to form the snow into balls. When you can form a snow ball that doesn’t crumble, it’s ready. Congratulations, you are now a snow maker. 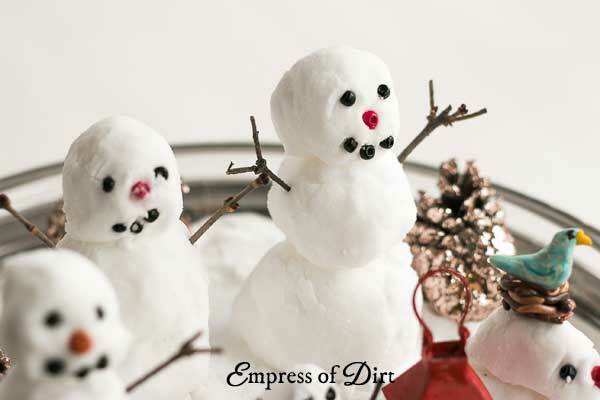 Here’s some tips for making snowmen like these ones. I used small beads like the ones you see here for the faces. If you like the classic look, you could also make a carrot nose with polymer clay. This post shares how to make little charms and more. The arms are twigs from a lilac bush. Anything will do. 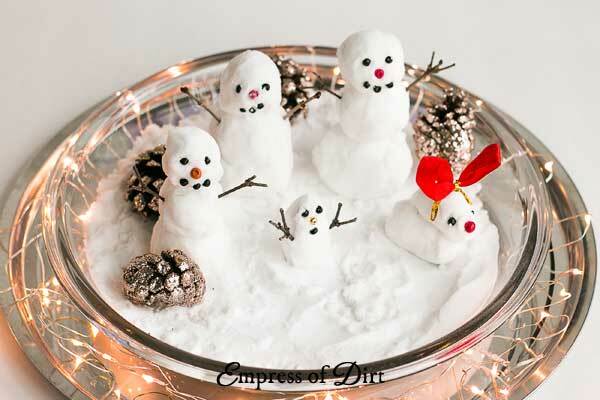 The snowmen are in a glass pie dish which is sitting on a silver serving tray. I added ‘snow’ on the ground using more baking soda, as well as glitter pinecones, and mini twinkle lights which are battery powered. I love the micro lights on thin copper wires. Another fun idea is to put the snowman in a champagne glass. You can get the little blackboard signs here on Amazon or at a dollar store. This is a fun idea for place cards at a holiday table. I hope you enjoyed this project. As mentioned, it really is super simple. 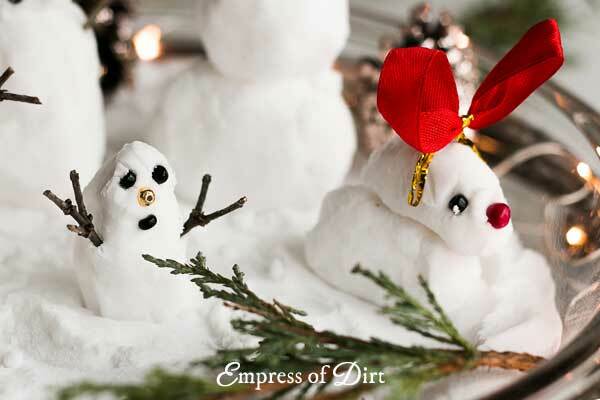 The snowman won’t last forever, but it’s a fun project to do with kids. I made it as a present . I put the snowmen in a globe and everyone was amazed. Next year I will make more of them. It’s a splendid idea. Thank you. Lovely idea. If you took a picture I would love to see it. Thanks, Anke!